Most agree that Saratoga has the most popular Classic Car Show event in the South Bay Area! The local classic car community says they love Saratoga and its Annual Classic Car Show held every July. “Chrome meets Country” in downtown Saratoga at this year’s 9th Annual Saratoga Classic Car Show where almost 300 colorful classic and cool cars will gather in the historic village along Big Basin Way (Hwy 9 will be rerouted for the show). Classy food, tasty beer and wine from local wineries and breweries, craft vendors, raffle prizes and a live band in the center of town all add up to a fun packed day for people of all ages. 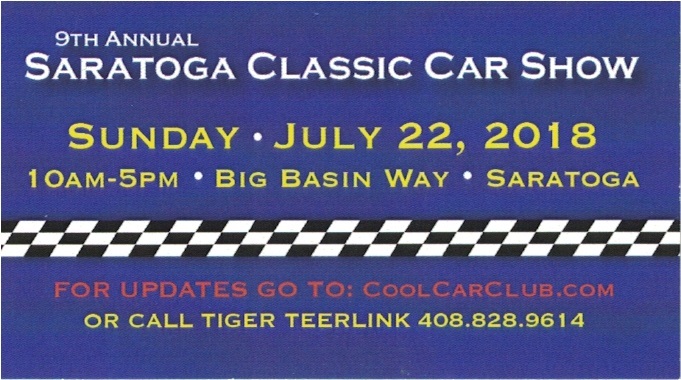 Back by popular demand is the Tri City “Cool Car” Cruise the day before the show between Saratoga, Campbell and Los Gatos. Attend various fun activities during CAR SHOW WEEK leading up to the show! Registration fee includes 2 lunches and registration packet with discount coupons from local merchants.